The acquisition of seismic data using nodes placed on the sea floor, Ocean Bottom Seismic (OBS) and its use in deep water with Ocean Bottom Nodes (OBN) have been growing rapidly in recent years due to considerable cost savings resulting from innovations in technology and operational concepts. 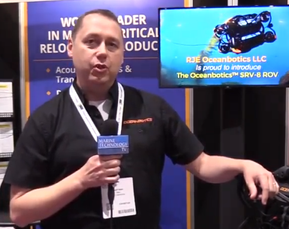 Claudio Paschoa, Marine Technology Reporter’s correspondent in Brazil spoke to Stephan Midenet, CEO of Seabed Geosolutions about OBS technology in general and OBN operations in Brazil. OBS technology has been around for academic applications since before World War II. The first use of the technology by the oil industry was in the late 1990s when OBS units were deployed to record long offset refraction data for improved velocity mapping west of the Shetland Isles. One of the first commercial reflection OBS survey was undertaken in 2003/4 by Seabird Exploration for Pemex over the Canterel/Sihil field offshore Mexico. 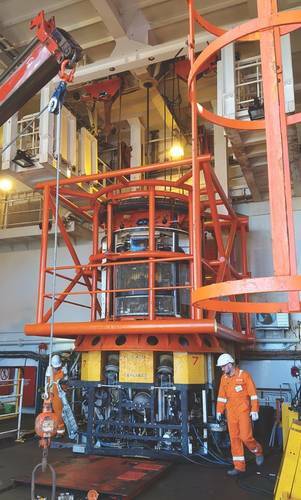 The node technology used for this survey was developed in Norway, following ground breaking research undertaken by Statoil (recently renamed Equinor) with their SUMIC (SUbsea seisMIC) ocean bottom four component cable system. “For many years the superior quality of OBS data over towed streamer data, even wide azimuth streamer data, has been widely accepted in the oil and gas industry. With the advent of “third generation” nodes – both lighter and smaller, as well as lower cost – and improved node deployment and recovery rates the costs of acquiring full azimuth/long offset OBS data have significantly been reduced. When simultaneous sources are also brought into the equation these costs drop even further, to the extent that applying OBS for exploration rather than its traditional role for appraisal and development is coming into play,” said Midenet. In addition to cost reductions, other factors have contributed to this advance: its superior wave field sampling ability - very long offsets, complete azimuth sampling and low signal to noise ratio; minimum impact on sampling in areas obstructed by offshore platforms and engineering structures submerged or installed in the seabed. Also, of fundamental importance, OBS operations are characterized by their relatively low environmental impact. It should also be noted that the demand for OBN projects in deep water plays increased during the recent crisis in oil prices, as they had a lower cost, compared to the seismic acquisition projects using streamers. The fundamental difference between Ocean Bottom Cable (OBC) and Ocean Bottom Node (OBN) is that the traditional sources of technical downtime in OBC – terminations, connectors, power distribution and data telemetry – have been eliminated in designing the node to be a battery powered 4-channel flash memory autonomous seismic data recording unit. The removal of the need for power distribution and data telemetry allows for complete freedom in the spacing between receivers and the improvement in reliability resulting from the removal of connectors and terminations, it also allows many more receiver stations to be deployed. These two elements have fundamentally improved the operational performance of OBN compared to OBC which in turn has made OBS data much more cost effective. Historically, OBN costs have been higher than narrow azimuth (NAZ) towed streamer acquisition, but the improved cost efficiencies arising from both third-generation nodes, improved node handling and deployment/recovery and simultaneous sources have reduced full azimuth long offset OBN costs to the point that they are very comparable with wide azimuth (WAZ) towed streamer costs. “Taking into account the environmental constraints offshore Brazil regarding the use of closely spaced seismic sources, OBN offers a unique solution for the full azimuth data needed to deliver the data quality needed to develop the pre-salt reservoirs offshore Brazil,” said Midenet. “Three OBN surveys have been acquired offshore Brazil and, at the time of writing this, a fourth is being finalized to allow the fifth to commence.” Globally there have been more than 360 OBN surveys since 2005 (source: Rystad Energy Research and Analysis, June 2018). 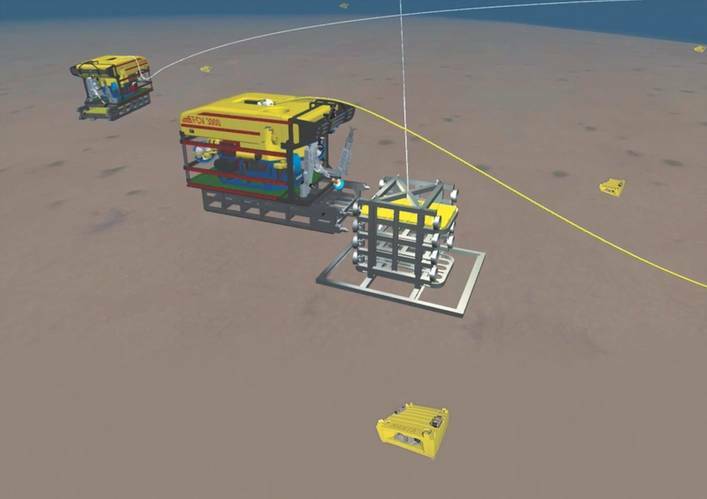 Seabed Geosolutions are continually increasing the level of automation in all areas of their operations to reduce HSE exposure and improve both operational performance and geophysical data quality. “We have been working with partners on the development of an autonomous OBN system called SpiceRack. The results of a 20-vehicle test, conducted in 2017, were presented at the 2017 SEG Annual Meeting in Houston. The operational model for both shallow and deep water utilizes the same technology and methodology, so we anticipate being able to conduct a deep water test of this technology shortly after we have successfully completed the shallow water test,” said Midenet. With the ongoing revival of the oil and gas marked in Brazil, due in part to increased offshore tenders, especially at promising pre-salt reservoirs and the recent rise in oil prices, there will consequently be an increase in seismic acquisition along the lengthy Brazilian coast. National Operator, Petrobras, is already investing in re-acquiring seismic data in the pre-salt portions of the maturing Campos Basin, which has been developed almost solely through post-salt reservoirs. Petrobras and other major players are also developing major deep water reservoirs such as Libra, Carcará and Sapinhoá, were OBN technology may be used both for reservoir appraisal, exploration and for fine-tuning production development. Seabed Geosolutions was established in 2013 as a joint venture between Fugro (60%) and CGG (40%) – uniting Fugro’s ocean bottom node expertise with CGG’s ocean bottom cable, node and transition zone operational experience. With headquarters in Leidschendam in the Netherlands, and offices in Houston, Dubai, Massy and Kuala Lumpur, Seabed Geosolutions has acquired more than 38,000 km2 of 3D ocean bottom seismic data since 2005.